Théâtre de Complicité's new work LIGHT was playing at the Almeida Theatre. I knew that LIGHT had sold out before it even opened, such is the fame of Complicité. Nevertheless, I phoned the Almeida every day for about a week, and one day, instead of the usual recording, I was connected to a person who told me two seats were available but only for the Wednesday matinée. I snapped them up feeling good luck overrode whatever difficulties this might cause. As a play LIGHT is extremely difficult to describe. 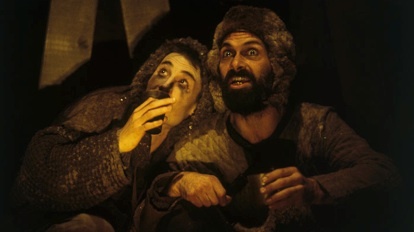 It is an adaptation by Simon McBurney and Matthew Broughton of the novel Ljuset (1987) by Swedish author Torgny Lindgren set in a medieval Norwegian village. A plague borne by rabbits wipes out virtually all the inhabitants of the village. As the years wear on, the villagers attempt to recreate the way their society worked or should work. One villager in particular, Könik, needs the clarity or "light" that firm rules can bring. It's rare to find a new play dealing with such fundamental issues as "How should a society be run? ", "How should authority be limited?" and "Is there a point to making laws when there is no one to enforce them?" The questions are very similar to those in William Golding's The Lord of the Flies, but where Golding is keen to show man's swift descent from civilization to barbarity, Lindgren (as viewed through McBurney and Broughton) focusses on the re-emergence of civilization from barbarity. The rabbit as a symbol of death again becomes a symbol of fertility. All these questions are presented through a highly imaginative theatricality--from the use of puppets and narration to the discovery of all manner of props under the floorboards of the stage to constructing even larger props from these boards. The actors of Complicité work as an ensemble with each intense performance contributing to the whole. Especially forceful were Tim McMullan as Könik and Lilo Baur as his wife. The play is so filled with linked images and ideas, it is difficult to take it all in in one viewing, but the experience is powerful. We had been told that Complicité was an exciting theatre company. Now we know why. Photo: Tobias Menzies and Tim McMullan. ©2000 Complicité.